When I meet with yoga instructors to discuss their branding or marketing strategy on social media I see the same mistakes again and again. 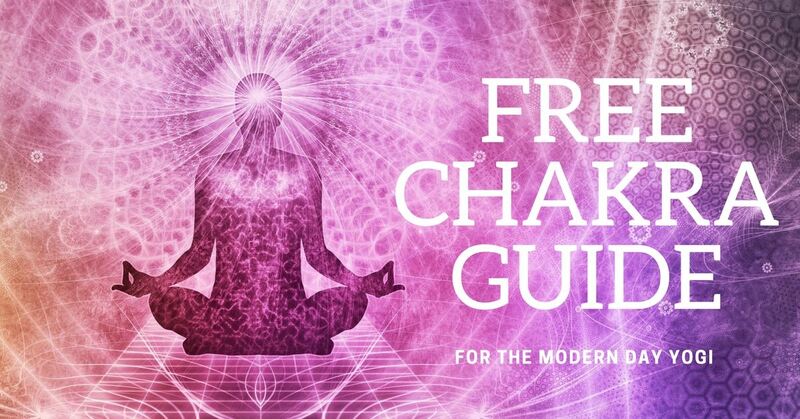 I’ve decided to share what I’ve learned over the years, so you and other yoga instructors can quickly learn how to grow your Instagram following without wasting valuable time like I did. 1. If you don’t use hashtags, start now. One thing I have learned over the years is the importance of using the tools Instagram gives you. One of the most important tools to use on Instagram is the hashtag “#”, or “pound sign” if you’re old school. Hashtags sort and group like images and make Instagram images searchable. Your yoga students are likely using these hashtags to look up inspiration for their own practices, so it’s in your best interest to be there! I see talented instructors failing to use hashtags on Instagram all the time. If you aren’t using hashtags your images will only be seen by your followers, people directly searching for you or by people snooping your feed. This isn’t good if you’re trying to grow your following, especially if you’re already putting a lot of time and effort into creating quality content. 2. Choose your hashtags wisely. Don’t use a bunch of random hashtags. Each hashtag you choose should be intentional. Also, check to make sure the hashtag you’re using is still active. No sense in using a hashtag that no one is using. Instagram has also been known to shut down hashtags that are overused or misused. Some unexpected hashtags Instagram has shut down or restricted are: #goddess, #instagirl, #killingit, #shesquats, #booty, #curvy, #publicrelations, #stopdropandyoga, #sunbathing, #woman, #womancrushwednesday, #women, #cheeky, #desk, #everybodyisbeautiful, #bikinibody, #bombshell, #adulting, #happythanksgiving, #newyears, #newyearsday, #freethenipple, #girlsofinstagram, #instabody, #instababe, #loseweight #popular, #thinspiration, #thinspo, and #wtf. Just don’t use these or any other more scandalous #hashtags and you’ll be fine. What hashtags should you be using as a yoga instructor? 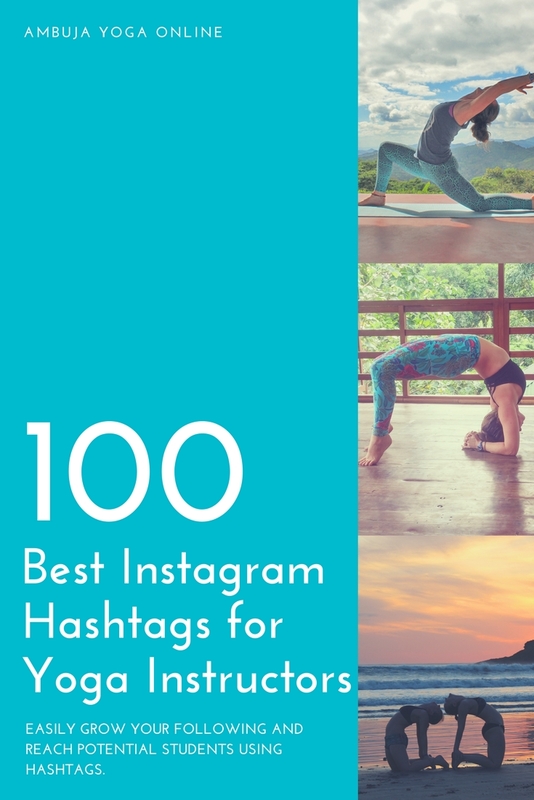 Here is a curated list of just over 100 popular hashtags specifically for yoga instructors and yogis. You will not grow your Instagram following by spamming on Instagram. Don’t post to the same hashtag group in back-to-back posts or multiple times a day. If you must post multiple images in a short amount of time from a specific event, use Instagram’s slideshow feature, so you’re not filling your followers feeds with your pics… Do not spam, period! 4. Don’t abuse your hashtags. I’m so excited. I went to a workshop with Dylan Werner in Bali and I can finally hold handstand on my own! Thanks @dylanwerneryoga! This is a mistake I see commonly with yoga instructors that are new to Instagram and are just learning to use hashtags. Keeping your captions clean, uncluttered and easy to read should be part of your strategy to grow your Instagram following. 5. Grow your Instagram following by engaging with hashtag users. Like and comment on the most recent posts in the hashtags you are using. If you catch someone while they are still online, and your comments are authentic they will check out your profile. If your profile resonates with them then they will likely like, comment and follow you too. Like I said before, make sure your comments are authentic and not just a ton of emojis or generic comments like “Cool”, “Love it”, etc. Use generic comments minimally. Pro tip: Comment on what they say in their caption, not just the image. It shows genuine interest. Save yourself time and keep your hashtag groups organized in a notes app. I like to use Google Keep personally, but use whatever works best for you. Once you have your hashtags stored in a notes app you can simply copy and paste them into the first comment. I like to have 5 dots, one on each line, before my hashtags start. By using the dots I can hide my hashtags and it doesn’t look spammy or desperate. 7. Have two to three sets of Instagram hashtags. Grow your Instagram following by creating two to three sets of Instagram hashtags for each type of post. For example, if you mostly post yoga asana pics create two groups of hashtags. With two sets of hashtags you won’t burn out or spam your hashtags and you won’t be competing with yourself for featured posts. If you also post delicious vegan food create one or two hashtag groups for this topic. If you post travel pics, create one or two hashtag groups for this post type too. And then don’t use the same hashtag group in back to back posts (unless they’re a day or two apart). 8. Use hashtags with many posts and fewer posts. Don’t just use the most popular hashtags. Use a variety of hashtags. If you only use the most popular hashtags you risk your images getting buried. If you also use smaller active (and more niche) hashtags you will be more likely to rank in the top nine and trend for that hashtag. You want this! It means more eyes are on you! 9. Keep it relevant: 2-3 topics. This is just a general rule of thumb. Once you’ve decided on your brand image and what’s important to you and your ideal client/student stick with two or three relevant topics. If you’re a studio you could focus on your yoga community (both instructors and students), events and inspirational quotes. If you’re a traveling yoga instructor you could post yoga pics, healthy food, and adventure pics. These are just ideas. You do you. 10. Create a brand hashtag. For example, if your business name is Ambuja Yoga your hashtag could be #ambujayoga. If people are snapping pics at your events, ask them to use your hashtag and ask them to tag you in the pic. You can even offer to repost/regram their pic to increase their exposure… it’s a win-win! You may also want to create an event hashtag. This is a fun way your students can share pics and connect with one another. 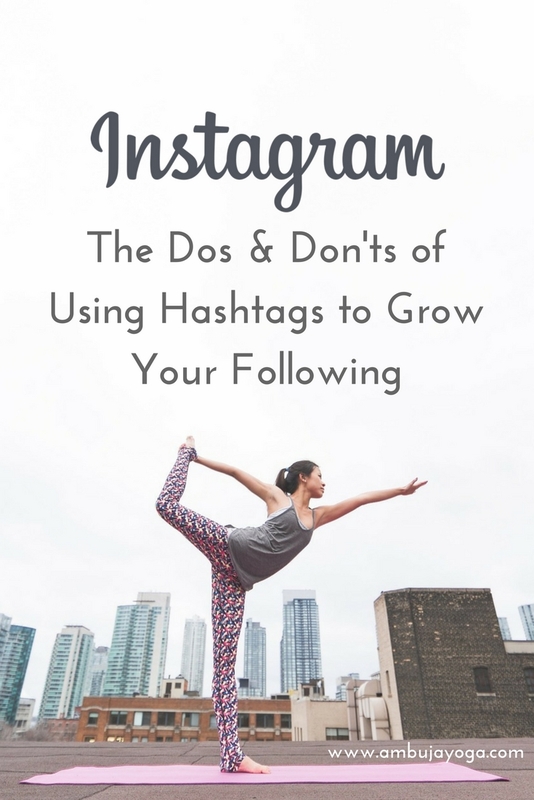 Still have questions about using hashtags to grow your Instagram following? Reach out via my contact form. I’m happy to help.